For more than 13 years, the National Complete Streets Coalition has believed that better engineering and design have the greatest influence on safety for all users of all abilities. Today, the Coalition is officially endorsing Vision Zero because we believe that it represents an important complement to safe street design. In the last few years, the Vision Zero movement, which originated in Scandinavia, has popularized the ambitious goal of eliminating all traffic fatalities. It’s exciting to see Vision Zero taking off as all hands are needed to reach zero deaths. We believe that all traffic fatalities can be prevented with better policy, design, and education. Today, we are thrilled to issue an official statement endorsing Vision Zero and safe street design, which you can read here. We have heard all of them, and heard them repeatedly, regardless of which town we are in or which project we are working on. 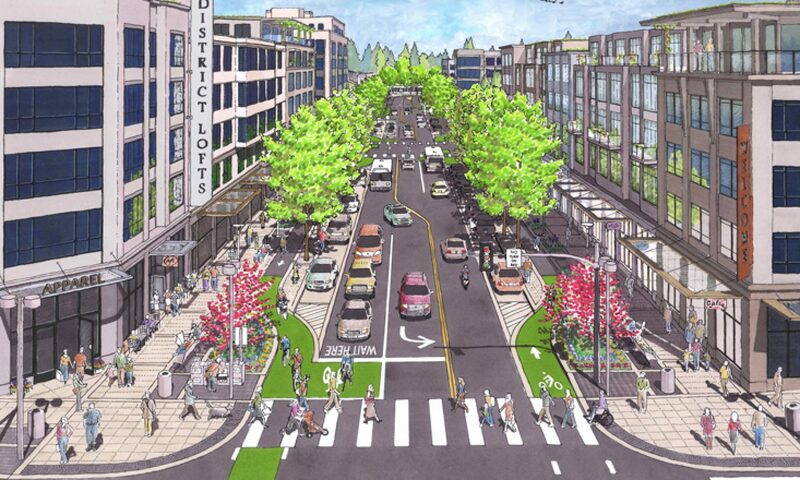 Here are three of the most common myths about the Complete Streets approach to building communities, and our perspective on why these are myths. Reality check: Just about everyone will tell you their town is unique. If they didn’t, they probably wouldn’t live there. But while we applaud individuals for feeling such strong civic pride, what is unique about towns has little to do with the streets and sidewalks and how people interact with them. A community’s uniqueness is related to its architectural and cultural assets, interesting destinations, creative and one-of-a-kind businesses, and the mix of cultures of the townspeople themselves. People drive, walk, shop, ride a bicycle, and spend money pretty much the same way wherever they go in the world, regardless of a town’s uniqueness. What is also common among most New Jersey towns is the high rate of pedestrian crashes; getting hit by a vehicle is not unique to any town, and neither are the preventative countermeasures that towns can take to eliminate them. For more information and the facts, see the Federal Highway Administration’s Proven Safety Countermeasures. “Over the last 60 years, Amsterdam’s leaders, planners and designers have by trial and error created a template for a city where bikes are the dominant force in transportation planning and design. That template has five essential characteristics; skip or short-change any one of them and your city of bikes won’t work as well. The Complete Streets Summit Taskforce has selected the Asbury Park Complete Streets Coalition to receive a Complete Streets Champion Award at the 2017 New Jersey Complete Streets Summit on October 24, 2017! The Complete Streets Summit Taskforce has selected the Asbury Park Complete Streets Coalition to receive a Complete Streets Champion Award at the 2017 New Jersey Complete Streets Summit on October 24, 2017. The Summit will be held at the Rutgers University College Avenue Student Center located at 126 College Avenue, New Brunswick, New Jersey. The program will begin at 8:30 a.m. and will conclude at 4:00 p.m. Awards will be given during a lunchtime ceremony. We hope representatives of the coalition will be able to attend to receive this honor and stay throughout the entire Summit. Any municipal staff members, elected officials, or other local advocates that supported the coalition’s work are also welcome to attend. We may be contacting you soon with regard to speaking or sharing your experience on a panel. If you and any guests will be able to join us, please let us know as soon as possible. Please contact Miriam Salerno at the New Jersey Bicycle and Pedestrian Resource Center at miriam.salerno@ejb.rutgers.edu with your RSVPs. Thank you for your hard work and leadership in bringing safer, more complete streets to New Jersey. APCSC will receive this honor tomorrow at Rutgers University! The Complete Streets Summit Taskforce has selected the Asbury Park Complete Streets Coalition to receive a Complete Streets Champion Award at the 2017 New Jersey Complete Streets Summit on October 24, 2017. An issue of equity, starting with beautiful, and visible piano key crosswalks on Springwood Ave. Piano key crosswalks being striped on Springwood Ave @inAsburyParkNJ for Better Block event Saturday, October 14 – safer & celebrate area’s musical history!